Watch all eyes light up when this red Christmas ceramic ornament bouquet arrives with only the freshest greens. A beautiful way to add holiday spirit to a table. This long-lasting arrangement will keep fresh for the holiday and last through the New Year. 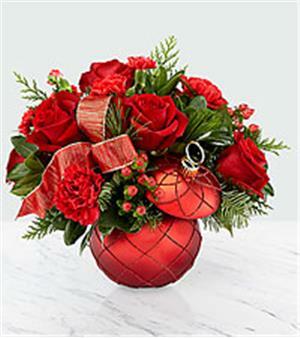 An elegant combination of red roses, carnations and berries, nestled in a bed of Christmas greens.